Relative to why donors gave in the past, that can be asked on a survey or in an interview. However, no matter how small the gift, the answer should never be reduced to multiple choice. In my opinion, the survey method should always allow for a long-form answer to this question, even if the data gathered is then harder to scale. We want all donors, no matter how many gifts they’ve made or how much they have given, to have the opportunity to answer this in their own words. And, to whatever extent possible, the answer should be recorded in the donor record and known by everyone who interacts with that donor. As Penelope Burk’s work has proven time and time again, it is pretty safe to study what will de-motivate a donor. There is no danger in asking what has or might cause a donor not to give, what has disappointed, angered or disengaged them. I strongly encourage organizations to ask these question–albeit delicately and respectfully–especially of their lapsed or disgruntled donors. The act of asking shows respect for the donor and a willingness to change on the part of the organization. 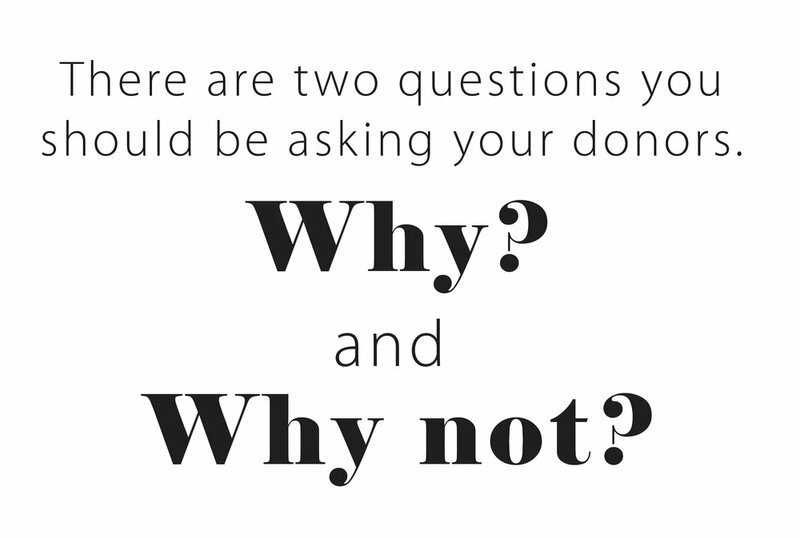 The second question is our holy grail: what will motivate a donor–this donor–to give again? This is the question we should never ask. Donors have a different relationship with our organizations than that of a customer to a retailer. There is no need we answer for our donors. They give because something in them wants to. We have to study them–as a group and as individuals–to make wise decisions about what that is and how to motivate it. That research happens by studying our practices and the donors’ behaviors in response to them.